The Shaw Prize was established by the late Mr Run Run Shaw in 2002 to honour international scientists in the fields of Astronomy, Life Science and Medicine, and Mathematical Sciences. Since the first prizes were awarded in 2004, many Shaw Prize Laureates have gone on to gain recognition by other prestigious awards including the Nobel Prize. We have great pleasure in presenting to the Chief Executive and honoured guests the 2016 Laureates. In Astronomy, the detection of gravitational waves is considered the greatest discovery in decades and has required the effort of over a thousand people. As LIGO founders, the initial contributions of Ronald W P Drever, Kip S Thorne and Rainer Weiss are credited to the project’s success. In Life Science and Medicine, Adrian P Bird demonstrated how chemical modifications of the DNA and the proteins that bind to them control gene functions. Huda Y Zoghbi showed that gene mutations in these proteins lead to the Rett Syndrome and other neurologic disorders. Mathematical Sciences 2016 is awarded to Nigel J Hitchin for his far reaching contributions to geometry, representation theory and theoretical physics which have made a wide impact on the field. We are indebted to the committees for selecting these laureates who will no doubt enhance the stature of The Shaw Prize. Ronald Drever, Kip Thorne and Rainer Weiss are the primary figures responsible for the conception and design of the Laser Interferometer Gravitational-Wave Observatory (LIGO). LIGO’s recent direct detection of gravitational waves represents the first probe of physics in the limit of strong gravity, where massive objects moving at velocities close to that of light drive nonlinear waves in spacetime. LIGO’s discovery ranks among the most significant ever made in astronomy, and its importance can be viewed from a number of distinct perspectives. Most simply, LIGO has provided a third strand to the means by which we can observe the universe, in addition to electromagnetic radiation or energetic particles. LIGO has thus established an entirely new branch of astronomy, allowing us to study phenomena where signals from existing astronomical messengers are entirely lacking. The impact of this new tool seems likely to be as revolutionary as, for example, the opening up of radio astronomy and the subsequent discovery of pulsars and quasars. The direct observation of gravitational radiation validates a basic prediction of general relativity, showing such fundamental expectations based on causality to be correct. However, LIGO’s results go much beyond the weak spacetime fluctuations already inferred from the orbital decay of pulsars in binary systems. By probing the region of strong and time-dependent gravitational fields from which the waves originate, they reveal remarkable properties of black holes. Black holes have been a feature of astronomical discussion at least since the detection of quasars in the 1960s, but almost all arguments for their existence were indirect. In X-ray binaries, or in the centres of galaxies, we see objects that are too compact and too massive to correspond to any alternative astronomical structure that can exist according to standard relativistic gravity. But a different theory of gravity might change this conclusion, for example by raising the maximum mass of a neutron star, so the existence of black holes could not be demonstrated without probing directly the characteristic features of general relativity, such as the event horizon. Even to demonstrate that a horizon existed would have been a huge step forward (towards which projects such as the Event Horizon Telescope have been dedicated). But LIGO has achieved this and much more: probing not only the structure of spacetime in strong gravity, but also how such a structure evolves dynamically. 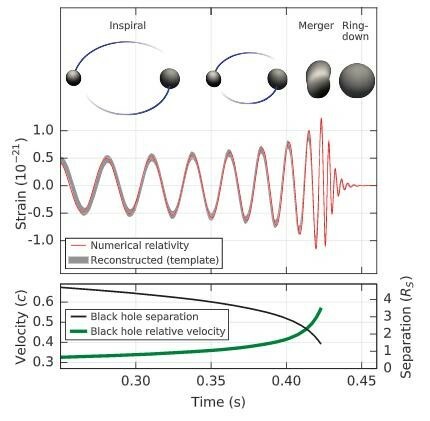 The results are as expected for the merger of a pair of black holes, even to the fine details of the ringdown oscillations of the horizon as the resultant single black hole settles to its final state, exactly as computed both analytically and numerically. All this pushes the validation of relativistic gravity into a completely new regime. Perhaps the most impressive feature of LIGO’s achievement is that it required the focused efforts of many scientists over more than four decades. But along the way, progress always hewed closely to the vision presented in the proposal that the LIGO team submitted to the US NSF in 1989. Such a triumph of team science is perhaps only matched by the 2012 detection of the Higgs boson at CERN. Fig 1: Estimated gravitational-wave strain amplitude from GW150914. Inset images show numerical relativity models of the black hole horizons as the holes coalesce. Bottom panel plots black hole separation in units of Schwarzschild radii (Rs=2GM/c2) and effective relative velocity divided by the speed of light, v/c, with f the gravitational wave frequency, and M the total mass. From PRL (2016). The expression of genes is titrated precisely to achieve the proper balance of functions in all human tissues, including the brain. Ratcheting expression up or down is orchestrated by proteins that bind to DNA, leading to suppression or activation of gene function, but it also depends on signals left on chromosomes, including chemical modifications of the DNA itself. Adrian Bird devised a method for mapping one such chemical mark along chromosomes, namely the presence of a methyl group on the cytosine residue in DNA. This revealed a pattern of methylated and non-methylated sites that helps demarcate genes that can be switched on from those that are to remain silent. One way that this works emerged from his discovery in the 1990s of five different proteins that depend on methylation for their binding to DNA and can silence genes. One member of the protein family, MeCP2, recruits a large complex of enzymes that chemically alter chromosome marks by removing an acetyl chemical tag from a major structural component of the chromosome known as histones. The inter-connection of these two chemical features – the presence of methylcytosine in chromosomal DNA and the loss of acetyl groups on histones – establishes ‘epigenetic’ marking of chromosomal regions causing gene activity to be turned down. The basic molecular mechanisms uncovered by Bird’s research acquired new significance through completely independent work on a seemingly unrelated biological problem. Huda Zoghbi, a pediatric neurologist studying genetic disorders associated with developmental delay and intellectual disability, made an unexpected connection between one of Bird’s methyl-cytosine-binding proteins, MeCP2, and a challenging neurological disorder called Rett syndrome. Rett syndrome was first described by Andreas Rett in 1966 as a distinct but oddly variable neurobehavioral condition in females. The disease affects approximately 1 in 10,000 girls who show normal development for 6 to 18 months, but as the disease takes hold, they become withdrawn, regress in their mental development, exhibit compulsive behavior such as incessant hand-wringing, and eventually lose all purposeful use of the hands. What made Rett difficult to understand was that it was usually sporadic, appearing out of the blue in an otherwise healthy family. But because Rett is mainly seen in females, and only very rarely in families where there had been early loss of male children, Zoghbi suspected it to be caused by an X-linked mutation that is lethal in males. In 1999, after 15 years of scrutinizing the genome, Zoghbi and colleagues discovered that mutations in MECP2 are the primary cause of Rett syndrome. Her discovery allowed a confusing set of symptoms to be turned into a straightforward diagnostic genetic test. Mutations in MECP2 are now known to cause a variety of neuropsychiatric features ranging from autism to juvenile-onset schizophrenia. The Zoghbi and Bird groups independently produced different genetic mouse models of Rett syndrome that reproduced the major symptoms of the disease. In dramatic contrast to the irreversible damage associated with many neurologic disorders, however, Bird’s group demonstrated that the animal model of Rett Syndrome could be restored to normal by reintroducing a functional copy of MeCP2 in adult animals, even though they were already symptomatic. His group also found that the MeCP2 protein is quite abundant in nerve cells, approaching the level of the major chromosome-binding histones; a change in MeCP2 function is thus likely to have a profound affect on chromosome structure in the brain. Zoghbi’s group showed that MeCP2 is critical for the normal function of many different types of neurons and that the brain is sensitive to relatively modest increases or decreases in the levels of MeCP2. In fact, doubling MeCP2 levels causes a progressive neurological syndrome in mice that is every bit as severe as Rett syndrome. These observations led to identifying MECP2 as the culprit in children with large duplications spanning the gene in Xq28. MECP2 Duplication Syndrome, which primarily affects male children, is now known to account for about 1% of cases of intellectual disabilities and autism. The Zoghbi lab was able to reverse this disorder in adult duplication syndrome mice by using antisense oligonucleotides (ASOs) to normalize MeCP2 levels. These discoveries showed the profound importance of epigenetics to neurobiology and now suggest a path to treatment of certain neurologic disorders using the emerging technology of gene editing and ASOs. These highly complementary studies show, once again, the power of basic science to uncover the fundamental basis of human development and disease. From antiquity the subject of geometry has been at the centre of mathematics. The ancient Greeks were fascinated by the subject and studied it extensively, giving us Euclidean geometry. The modern view of geometry dates to the middle of the 19th century, when Gauss introduced and developed the theory of curved surfaces. He was followed by Riemann who constructed the theory of higher-dimensional curved spaces, now called Riemannian geometry. Their work began a period of flowering of geometry, and our present-day understanding of the subject emanates directly from their work. Nigel Hitchin is one of the most influential geometers of our time. The impact of his work on geometry and on many of the allied areas of mathematics and physics is deep and lasting. On numerous occasions, he has discovered elegant and natural facets of geometry that have proven to be of central importance. His ideas have turned out to be crucial in areas of mathematics and physics, far removed from the context in which he first developed them. By exploring ignored corners of geometry, Hitchin has repeatedly uncovered jewels, many more than described below, that have changed the course of developments in geometry and related areas, and changed the way mathematicians think about these subjects. In the modern period geometry has flourished and expanded greatly. With the development of topology (which may be described as the study of shapes, allowing deformation but not tearing) as an independent discipline in mathematics around 1900, the purview of geometry expanded to include auxiliary objects associated with spaces. A prime example is gauge theory, which is the study of the geometry of certain curved structures over spaces known as fiber bundles. Geometry has close connections to other parts of mathematics such as representation theory, which is related to the study of symmetry, differential equations and dynamics, and number theory. It has had a profound impact on topology. Its connections to physics are long-standing as well: Einstein formulated general relativity in terms of the geometry of curved four-dimensional spacetime, essentially in the form that Riemann had introduced. More recently, the standard model of particle physics is formulated using the geometry of gauge theories, and much of theoretical high-energy physics beyond the standard model is formulated geometrically. While Hitchin has introduced many important concepts and techniques in geometry, one of his most influential works is his study of Higgs bundles over a Riemann surface. The parameter space of all Higgs bundles over a fixed surface is itself a fiber bundle over that surface. On these fiber bundles Hitchin defined a natural function that produces an algebraically completely integrable Hamiltonian system on the space. The result is what is now called the Hitchin fibration of the space of Higgs bundles. One aspect of these spaces is that they give fundamental examples of important objects known as hyperkahler manifolds. But the impact of Hitchin fibrations is not limited to Higgs bundles and hyperkahler manifolds. Hitchin fibrations and his quantization of them are cornerstones of the construction of a modern branch of representation theory called ‘the geometric Langlands program’. In addition, they are a foundational ingredient in Ngo’s recent Fields-Medal-winning work in the theory of automorphic forms and number theory. In a related work, Hitchin used this theory to construct projectively flat connections over the moduli spaces of Riemann surfaces, which had been predicted by Witten's analysis of Chern-Simons theory, a three-dimensional topological quantum field theory. Hitchin fibrations have also served as a point of departure for physicists in their studies of certain four- and six-dimensional quantum field theories. The story of Hitchin fibrations is a perfect example of Hitchin’s ability to find appealing and natural questions that had been previously overlooked but whose answers are of fundamental importance across a wide spectrum of mathematics and physics. Hitchin's work with Atiyah, Drinfeld and Manin brought mathematics to bear on a question of fundamental importance in physics, namely the description of the moduli space of instantons on four-dimensional Euclidean space. Their approach using linear algebra, even now, thirty years later, forms a basis for much work on the study of instantons in both mathematics and theoretical physics, and serves as an important bridge between mathematics and physics. The Kobayashi–Hitchin conjecture relating algebro-geometric stability and solutions to the partial differential equations describing instantons on complex algebraic surfaces was one of the first examples of a close relationship between the notion of stability in algebraic geometry and solutions of non-linear partial differential equations. This fundamental principle has reoccurred in various forms in many areas of mathematics. The influence of Hitchin's work across the wide sweep of geometry and its applications to allied fields will be felt far into the future. His many achievements richly merit the award of the Shaw Prize in Mathematical Sciences.